Longleaf Pine - Pinus palustris often reaches heights of more than 80 feet tall and generally no more then 2.5 feet in diameter. It is a tall straight conifer with an irregularly shaped open crown with widely scattered limbs. The open canopy has as much daylight present as it does branches. Large buds growing on branch ends are covered with silvery scale. The trunk is long, straight and limb free. Seedlings go through a grass stage where it is simply a single short stalk topped with a mop like tuft of long needles. Peeling back the the bark surface will reveal a clay brown to rust red color inner bark. The needles of the Longleaf Pine are noticeably long, measuring 10-16 inches, growing in bundles of three. The cones of the Longleaf Pine are the largest of any Pine in the area reaching sizes of 6-10 inches long. The winged seeds drop out of the cones each Fall. Longleaf Pine has many marketable products. 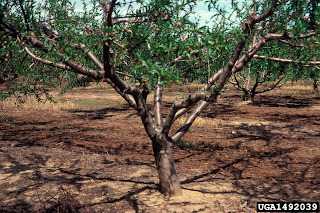 It is considered to be a premier lumber tree and is harvested in many different types of markets. Longleaf Pine Needles are raked, baled and sold as Pine Straw Mulch. In earlier days even the Sap was collected and used in making Turpentine and other chemical compounds. The large Cones are even collected and sold to craftsmen. The natural range for the Longleaf Pine covers the piedmont and coastal plains regions of Southeastern Virginia, North Carolina, South Carolina, Georgia, Florida, Alabama, Louisiana and Eastern Texas. Regionally it is also called Georgia Pine, Hard Pine, Heart Pine, Southern Yellow Pine or Yellow Pine. The Bigleaf Magnolia (Magnolia macrophylla) is most easily recognized by it's very large leaves, flowers and cone-like fruit. 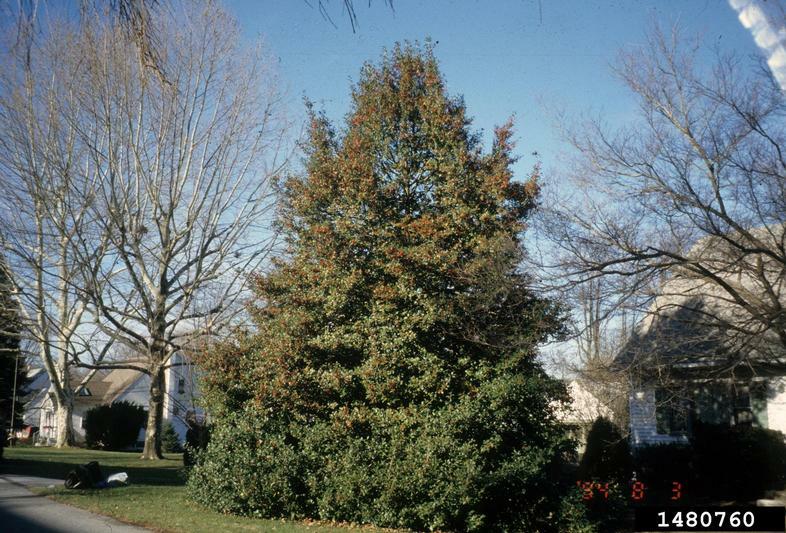 It is a deciduous tree that can reach heights of up to 60 feet. The Bigleaf Magnolia has a single erect trunk with a pyramidal shaped crown and spreading branches. 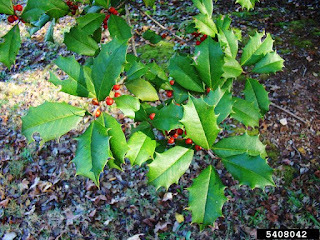 It is native to moist, rich woodlands and slopes from Louisiana to Georgia in the south and Southern Indiana to West Virginia in the North. This species is also cultivated outside of it's native range for ornamental purposes. The Ashe's Magnolia is similar in appearance but the native ranges do not overlap. 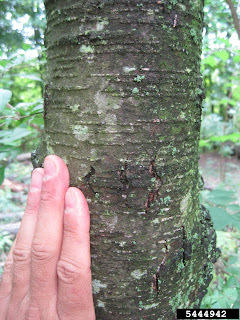 The bark of the Bigleaf Magnolia is pale grey or yellow-brown, smooth or slightly bumpy with inconspicuous plates. 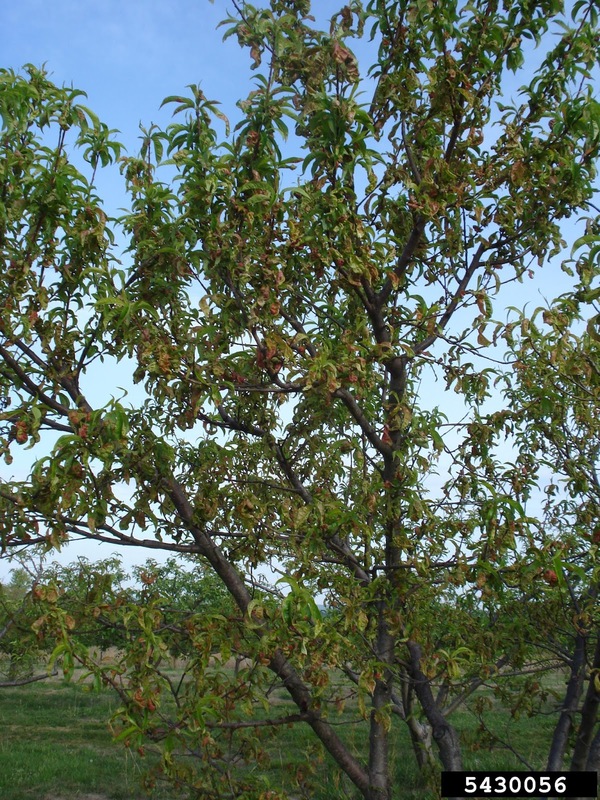 The leaves are borne in whorl like clusters that occur near the branch tips. They are simple obvate to broadly elliptical, wider around the middle. The upper surface is dark green and hairless while the lower is surface is white chalky and hairy. The flowers are fragrant, showy, creamy white in color, with a purple blotch at the base. The fruit is a cone like aggregate of folicles that are round or slightly egg shaped, red when aged and splitting to reveal orange-red seeds that are 10-12 mm long. The fruit matures in late summer. The Honey Locust - Gleditsia triacanthos is a large deciduous tree with an open spreading crown and branched spines growing from the trunk and branches. It is most easily recognized by the combination of pinnate and bipinnate leaves, large visible thorns and elongated legume. Known to reach heights of 80-140 feet, they are considered a medium to large tree. Though in most areas it reaches an average of 65-100 feet. The fruit is a flat black - brown hairy pod (legume) often a foot or more long and twisted in appearance. The leaves each have 7-16 pairs of leaflets and are a true green color during the growing season changing in the fall to a lovely yellow color. Flowers are greenish-yellow, bell shaped and grow in small upright symmetrical clusters. 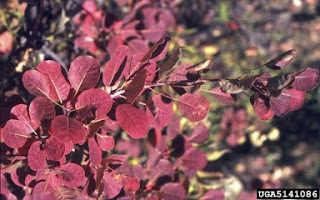 The bark is red when young becoming brown and deeply furrowed with narrow ridges when mature. 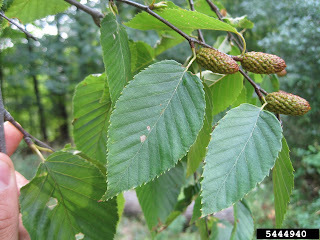 The Slippery Elm - Ulmus rubra is a medium sized tree that seldom reaches heights of more then 70 feet tall when fully mature. 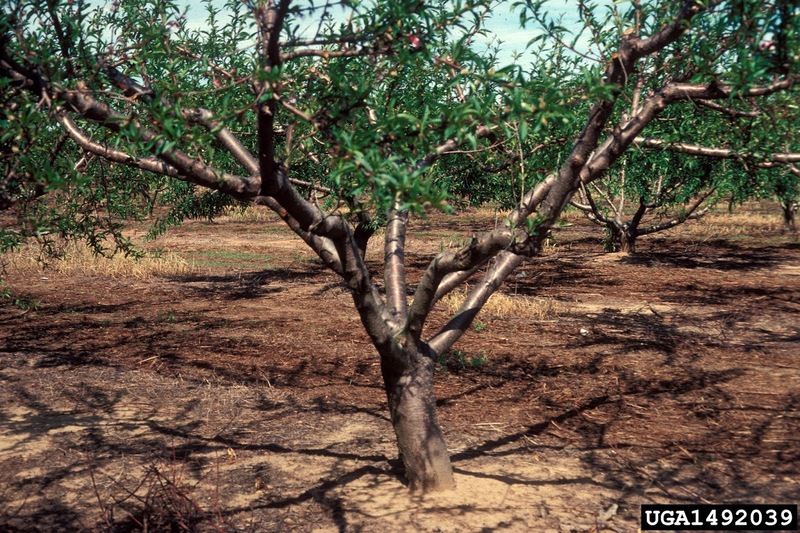 When grown in an open area this tree tends to have a broad crown with long tapering branches and upward turned twigs. From a distance the crown is sometimes described as two open hands touching at the wrist and then spreading away from one another. The Slippery Elm is native to the Eastern United States from Maine to North Dakota in the North and Florida to Texas in the South. 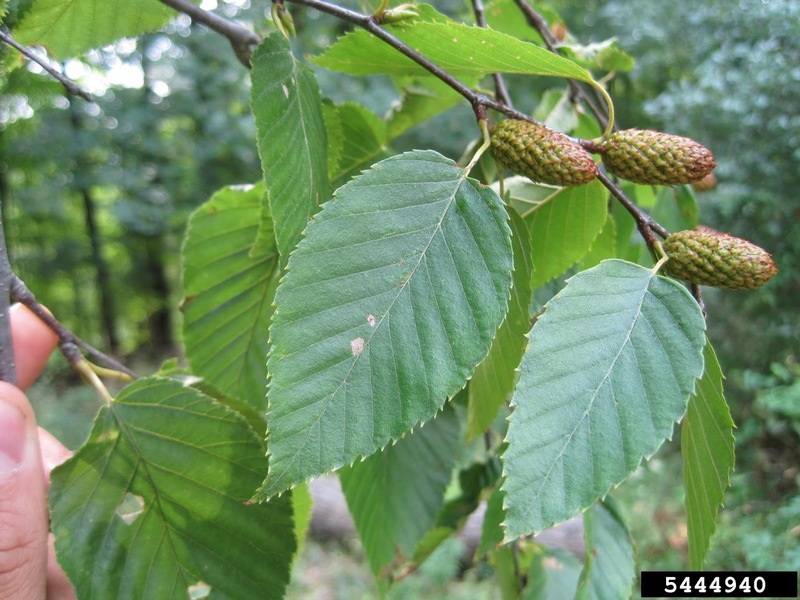 Slippery Elm is not typically planted as an ornamental tree, but does provide shade by growing upright along fencerows that are already established. 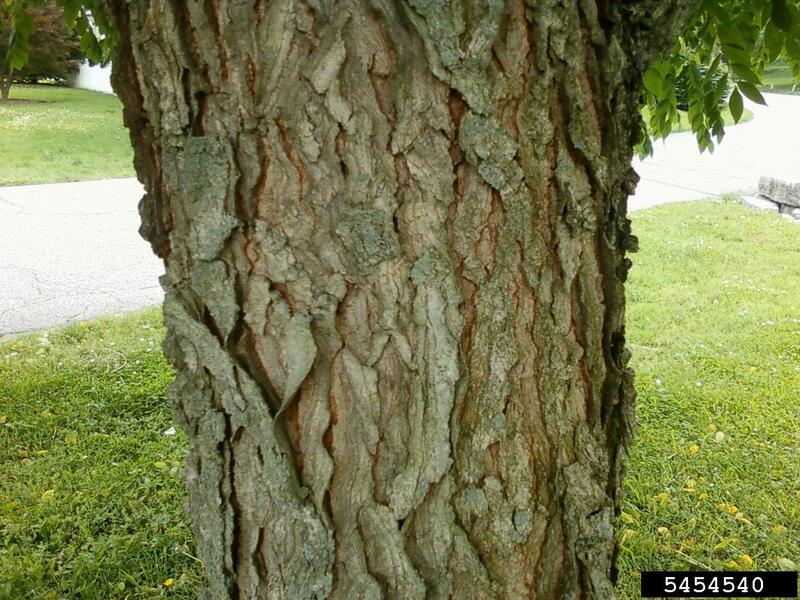 The bark of the Slippery Elm ranges in color from light silvery gray to reddish brown. 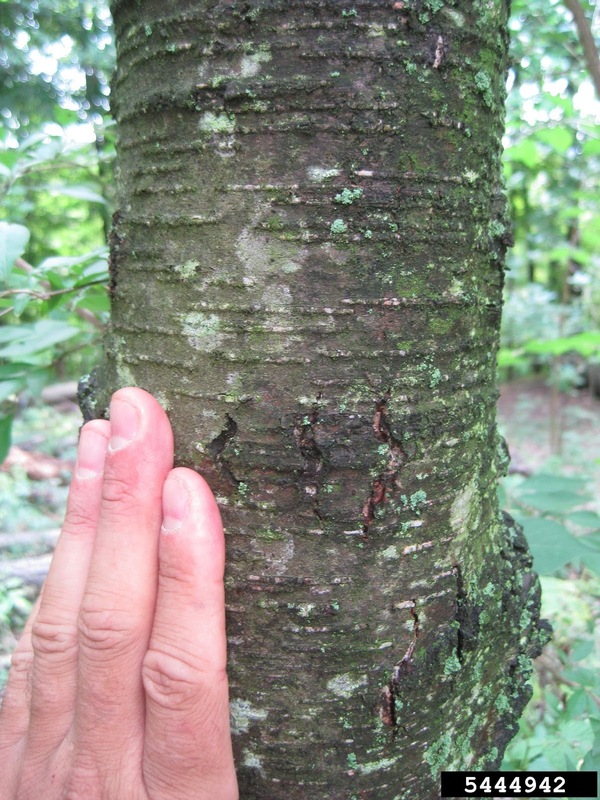 The texture of the bark is a matrix of thin, wide, tight, flat topped, rough ridges with rounded edges divided by shallow irregularly shaped valleys. The bark plates often appear to be more of a plastered collection then divided from one another by ridges and valleys. The leaves are double toothed 4-7 inches long and 2-3 inches wide, more or less oval in overall shape. The upper leaf surface is dull in luster and dark green in color, rough in texture similar to sandpaper. The lower leaf surface is is very hairy and also rough to the touch. 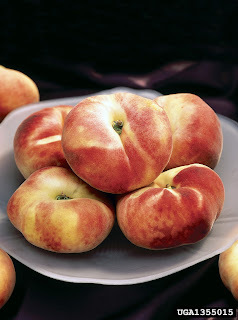 The fruit is a very small, flat, papery, circular, winged disk that is borne each Spring. The Georgia Plume - Elliottia racemosa, is most easily recognized by the large plume like inflorescence of white flowers that appears in late June each year. 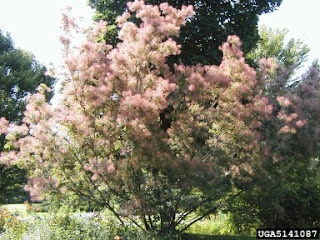 It is a deciduous shrub or small tree that reaches heights of 6 - 36 feet tall, growing in an erect fashion with a single trunk and narrow crown. It is native though rare in only a few locations in Georgia. Elliottia is a small genus of 4 species, two of which are endemic to Japan and 2 to North America, one of which is a Western shrub. 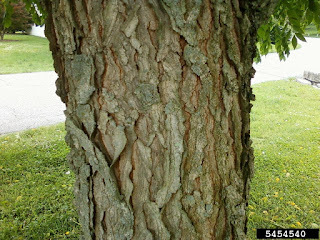 The bark of the Georgia Plume is gray and furrowed when young, becoming blocky and similar to that o the Sourwood when mature. The leaves are alternate, simple, ovate, oblong or narrowly elliptic with a tapered base and abruptly pointed tip. The upper leaf surface is dark green and hairless, the lower surface is paler and sparsely haired. The flower is bi-sexual about 2 cm long with 4 petals, white in color produced in showy terminal racemes or panicles. The fruit is a four lobed brown or blackish colored capsule that is approximately 1 cm in diameter maturing each Autumn and persisting into the Winter each year.